It was kind of hard choosing an excerpt - it was supposed to be only 2-3 minutes (although some did go much longer, but I was being a good little nominee and sticking to the request) and I wanted something that stood alone and made sense without an intro within that time frame. I also wanted to choose something technical rather than a plain action sequence. In the end I went with the same passage that's excerpted at the start of the book (although that's a cut-down version). And Kristin did a great job! 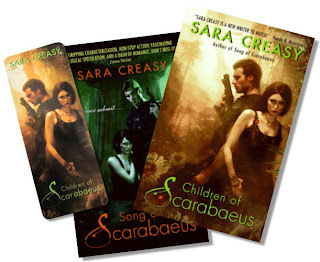 Today there's another Aussie giveaway of Children of Scarabaeus over at Kylie Griffin's blog, along with an interview with yours truly. So many punks! It all started with cyberpunk, which comes from cybernetics and punk. Wikipedia tells me one Bruce Bethke wrote a short story with that title in 1983, and the term was coined. These stories feature high technology and broken-down societies, with marginalized main characters who tend to be hackers of some sort. Well-known examples are William Gibson's Neuromancer and the movie Blade Runner. 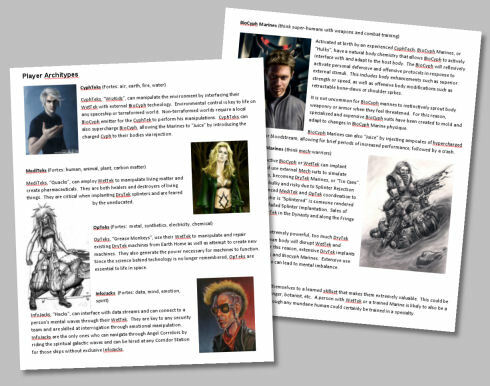 Then came steampunk, which is currently a top trend. It features alternate (alternative, dammit!) historical settings, usually Victorian, where electricity was never invented. Anachronistic machinery and technology that we might recognize, such as computers and robots, run on steam power. We also have clockpunk, which uses clockwork power instead of steam. I have never read any stories in this genre but apparently they tend to be set in the Renaissance, using Leonardo da Vinci-style inventions. Biopunk is a term I only heard of this year but should have had a handle on sooner, because apparently my Scarabaeus books fit the bill. This subgenre focuses on biotechnology, genetic engineering and the like, and the consequences of such things going Horribly Wrong. I heard about icepunk for the first time during DABWAHA last month, when Kate Elliott's Cold Magic was up against my book (she beat me, of course). It's "steampunk on ice" according to Kate. I've ordered this book and can't wait to read it. And now we have bugpunk, thanks to Kameron Hurley and God's War -- which I must read even though it has a kickass female (I find kickass females a bit irritating). She uses this term in her tagline and, for all I know, invented it. The technology and fuel in God's War run on alien bug power, which sounds downright cool. So did I miss any punks? What kind of punk should sci-fi writers turn to next? 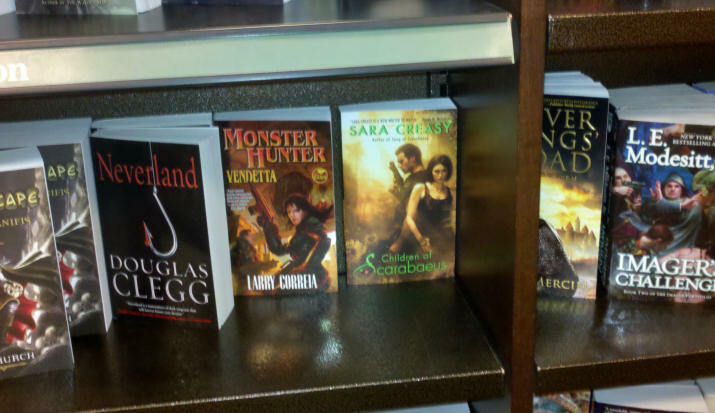 At the Mall of America Barnes & Noble in Minnesota, celebrations are ON for the release of Children of Scarabaeus. 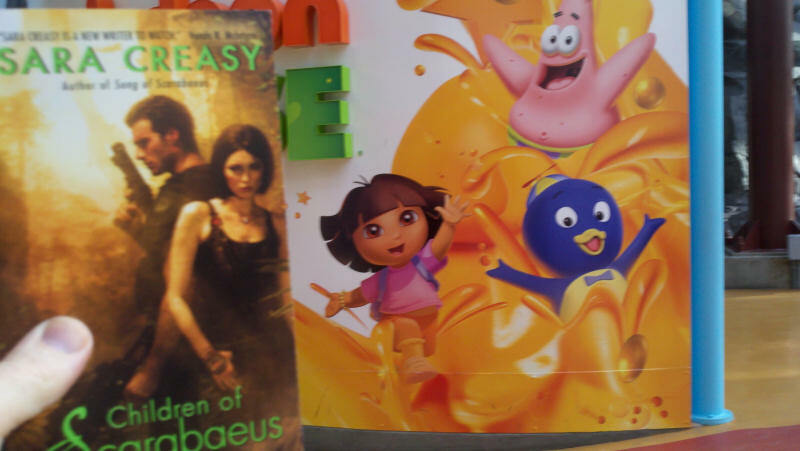 As you can plainly see, SpongeBob SquarePants is jumping for joy, while Dora the Explorer and friends can hardly contain their excitement. Many thanks to Lynn for snapping these shots! If anyone else sees Children of Scarabaeus in their local store, please send along a pic. Okay, as I can't be in North American bookstores right now, I need your help. 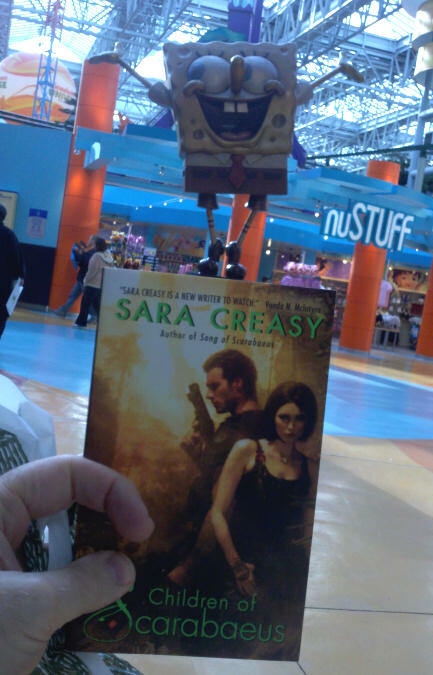 If you see my book in your local store, please take a moment to snap a photo and email it to me (saracreasy@gmail.com). When SONG came out, I went to my local stores and signed copies and took pictures and generally hung around the area feeling special. 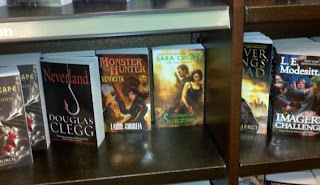 I desire the vicarious pleasure of seeing my name on the shelves a second time around. 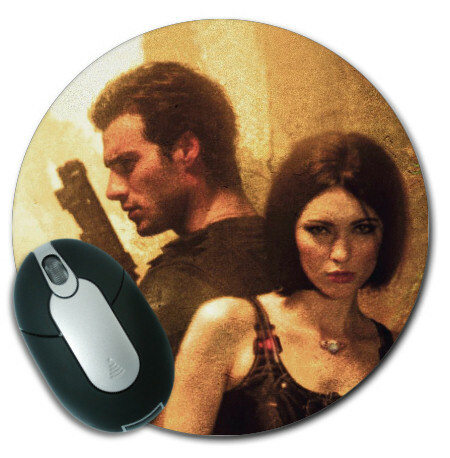 Don't forget to read the posts over the last few days for other links to giveaways, and for my mousemat giveaway too. Follow the blog link tours on the right for interviews and stuff.